We sell Doves Farm products like Doves Organic Wholemeal Spelt Flour 1kg online in the UK and directly from our award-winning store in Scotland. Spelt grain, triticum speltum, is mentioned in the Old Testament book of Ezekiel. Hildegard of Bingen praised it in the 12th century. Might be tolerated by some people with a wheat intolerance (but not suitable for coeliacs!). Doves Organic Wholemeal Spelt Flour is once again popular with nutrients. It takes a few days to get a sourdough starter going but once it’s active you can mix up your vegan pancake batter in the evening, let the magic happen overnight and cook these chunky pancakes for breakfast. This recipe contains 8-10 tbsp Doves Farm Organic Wholemeal Spelt Flour. 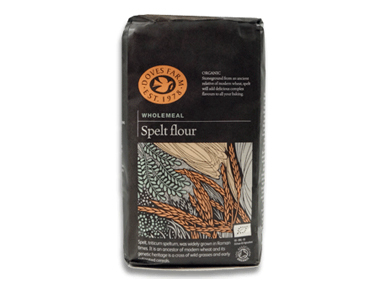 Where can you buy real Wholemeal Spelt Flour safely online? If you are wondering where you can buy Doves Organic Wholemeal Spelt Flour 1kg safely online in the UK, then shop with us. Wholemeal Spelt Flour - Doves Organic Wholemeal Spelt Flour 1kg in Other Flours and Baking.